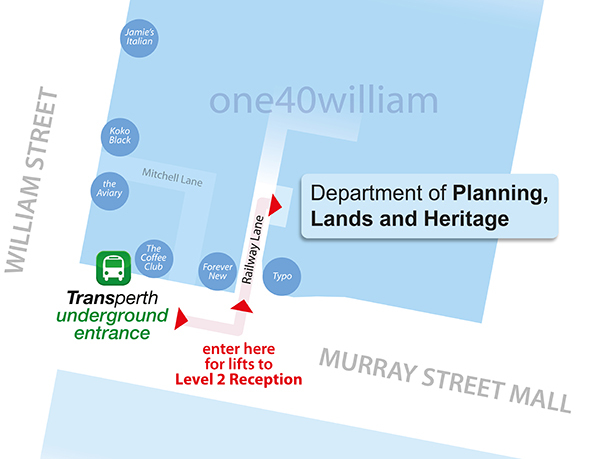 Welcome to the Department of Planning, Lands and Heritage. To contact us, please complete the below enquiry form or browse below for contact details relevant to your enquiry. General enquiry form. How can we help you? We also welcome your feedback during this website transition period and are happy to help you locate information and explain any changes. Please press/click the submit button once to lodge this form. Gordon Stephenson House, 140 William Street, Perth, Western Australia. Please call our office between 8:30am and 5:00pm, Monday to Friday. You can contact us by email at your convenience. Please refer to the list below to find the appropriate email address for your query. General enquiries can be made via the above contact form. A feedback and complaints form is also available. The Registrar of Aboriginal Sites is appointed under the Aboriginal Heritage Act 1972 (Act) to administer the day to day operations of the Aboriginal Cultural Material Committee and also to perform other functions as allocated to the Registrar under the Act. See the Freedom of information page for details on how to apply for access to information. For tenant emergency matters only. General queries cannot be responded to or redirected through this line.